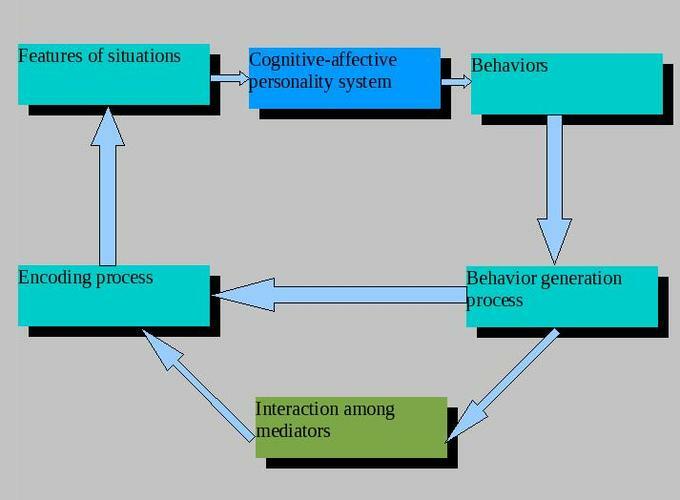 Mischel’s cognitive-affective personality theory countered earlier trait theories and resulted in the person–situation debate. The social- cognitive perspective on personality is a theory that emphasizes cognitive processes, such as thinking and judging, in the development of personality. Walter Mischel (1930–present) is a personality researcher whose development of the cognitive-affective personality model has helped to shape the social-cognitive theory of personality. Mischel suggests that an individual’s behavior is fundamentally dependent on situational cues; this counters the trait theories’ perspective that behavior is dependent upon traits and should be consistent across diverse situations. The conflict of ideas between Mischel’s model and earlier trait theories became known as the person–situation debate, or “trait vs. state”. The topic debated is whether traits or situations are more influential in predicting behavior. Mischel found distinctive but stable patterns of “if-then” situation-behavior relations that form personality signatures: if x situation occurs, then y behavior might result. One of Mischel’s most notable contributions to personality psychology are his ideas on self-regulation, as demonstrated in his famous Stanford marshmallow experiment on delayed gratification. personality signature: An individual’s pattern of situation-behavior reactions proposed by Walter Mischel to predict behavior. delayed gratification: The act of denying one’s self an immediate reward in return for a better reward in the future. social cognitive theory: A theory of personality that emphasizes cognitive processes, such as thinking and judging. The social-cognitive perspective on personality is a theory that emphasizes cognitive processes, such as thinking and judging, in the development of personality. These cognitive processes contribute to learned behaviors that are central to one’s personality. By observing an admired role model, an individual may choose to adopt and emphasize particular traits and behaviors. Walter Mischel (1930–present) is a personality researcher whose work has helped to shape the social-cognitive theory of personality. He ignited a controversy in the field of personality research in 1968 when he deliberately criticized trait theories and proposed that an individual’s behavior in regard to a trait is not always consistent. Prior to his research, trait theories argued that an individual’s behavior is mostly dependent on traits like conscientiousness and sociability, and these traits are expected to be consistent across different situations. Mischel’s experiments suggested that an individual’s behavior is not simply the result of his or her traits, but fundamentally dependent on situational cues—the needs of a given situation. Mischel’s ideas led him to develop the cognitive-affective model of personality. Cognitive-Affective Model of Personality: Mischel’s research in personality led him to develop the cognitive-affective model, which argues that an individual’s behavior, rather than simply being a result of traits, is fundamentally dependent on situational cues—the needs of a given situation. As shown in this diagram, features of situations, behaviors, behavior generation processes, and encoding processes are all interconnected. The conflict of ideas between trait theories and Mischel’s cognitive-affective model became known as the person–situation debate, or “trait vs. state.” If someone is considered “nice,” are they nice in every situation? Is the trait more important in predicting behavior, or the situation? Some traits, like intellect, are stable across situations; however, people may change other aspects of their personality from situation to situation. Although his early research focused mostly on the importance of situation, this controversy was stimulated specifically by Mischel’s later research showing that both trait and situation are important in predicting behavior. This argument contradicted the fundamental tenet of trait theory that only internal traits, not external situations, should be taken into account. Mischel made the case that the field of personality research was searching for consistency in the wrong places. Rather than treating situational factors as “noise” that caused errors of measurement in personality, Mischel encouraged researchers to incorporate situational findings into their experiments and look for the consistencies that characterize an individual in a variety of contexts. He found that although behavior was inconsistent across different situations, it was much more consistent within situations—so that a person’s behavior in one situation would likely be repeated in a similar one. Mischel suggested that consistency would be found in distinctive but stable patterns of “if-then” situation-behavior relations that form personality signatures. In other words, if x situation occurs, then y behavior might result. Rather than defining people merely by their traits (“he is an irritable person”), he argued that personality research should factor in the importance of the context (“he is irritable when talked down to”). In this way, Mischel emphasized the importance of physical, social, and environmental forces in shaping behavior. The theory of personality signatures was supported in a large observational study of social behavior across multiple repeated situations over time (Mischel & Shoda, 1995). These findings contradicted the classic trait-theory assumption that individuals who shared a specific trait would behave in a similar manner. In Mischel’s study, individuals who were similar in average levels of behavior, such as aggression, differed predictably and dramatically in their aggressive behavior depending on the type of situation they were in. Their behaviors supported the “if-then” behavioral signatures proposed by Mischel. This work has given researchers a new way to conceptualize and assess both stability and variability in behavior that is produced by the underlying personality system. One of Mischel’s most notable contributions to personality psychology is his work on self-regulation. Self-regulation refers to the ability to set and work toward goals; it is often described as willpower and often relates to the ability to delay gratification. Delayed gratification is the concept of denying oneself a reward in the present to get a better reward in the future. Mischel’s now-famous Stanford marshmallow experiment examined the processes and mental mechanisms that enable a young child to forego immediate gratification and wait for a better, but delayed, reward. Preschoolers were presented with a marshmallow (or other small snack) and offered the choice of eating the snack immediately or getting two snacks if they waited 15 minutes to eat it (while the researcher left the room). What Mischel found was that young children differ in their degree of self-control. Mischel and his colleagues continued to follow this group of preschoolers through high school, and they found that children who had more self-control in preschool (the ones who waited for the bigger reward) were more successful in high school. They had higher SAT scores and more positive peer relationships, and were less likely to have substance abuse issues; as adults, they also had more stable relationships (Mischel, Shoda, & Rodriguez, 1989; Mischel et al., 2010). On the other hand, those children who had poor self-control in preschool (the ones who grabbed the one marshmallow) were not as successful in high school and were found to have academic and behavioral problems. Today, the “trait vs. state” debate is mostly resolved, as most psychologists consider both the situation and personal factors in understanding behavior. For Mischel (1993), people are situation processors: the children in the marshmallow test each processed, or interpreted, the reward structure of that situation in their own way. Mischel’s approach to personality stresses the importance of both the situation and the way the person perceives the situation; instead of behavior being determined by the situation, people use cognitive processes to interpret the situation and then behave in accordance with that interpretation. Bandura’s and Rotter’s social-cognitive theories of personality emphasize cognitive processes, such as thinking and judging. Social- cognitive theories of personality emphasize the role of cognitive processes, such as thinking and judging, in the development of personality. Albert Bandura is a behavioral psychologist who came up with the concept of reciprocal determinism, in which cognitive processes, behavior, and context all interact with and influence each other. Rotter expanded upon on Bandura’s ideas and developed the term locus of control to describe our beliefs about the power we have over our lives. A person with an internal locus of control believes that their rewards in life are guided by their own decisions and efforts. If they do not succeed, they believe it is due to their own lack of effort. A person with an external locus of control believes that rewards or outcomes are determined by luck, chance, or other people with more power than them. If they do not succeed, they believe it is due to forces outside of their control. self-efficacy: The term used to describe how one judges one’s own competence to complete tasks and reach goals. locus of control: The extent to which individuals believe that they can control events that affect them; can be either internal or external. social learning theory: A theory that assumes people learn certain behaviors through observing and imitating the behaviors of others, and then being rewarded or punished for behaving that way. learned helplessness: The condition of a human or animal that has learned to behave helplessly, failing to respond even though there are opportunities for it to help itself by avoiding unpleasant circumstances or by gaining positive rewards. Social-cognitive theories of personality emphasize the role of cognitive processes, such as thinking and judging, in the development of personality. Social cognition is basically social thought, or how the mind processes social information; social-cognitive theory describes how individuals think and react in social situations. How the mind works in a social setting is extremely complicated—emotions, social desirability factors, and unconscious thoughts can all interact and affect social cognition in many ways. Two major figures in social cognitive-theory are behaviorist Albert Bandura and clinical psychologist Julian Rotter. Albert Bandura is a behavioral psychologist credited with creating social learning theory. He agreed with B.F. Skinner’s theory that personality develops through learning; however, he disagreed with Skinner’s strict behaviorist approach to personality development. In contrast to Skinner’s idea that the environment alone determines behavior, Bandura (1990) proposed the concept of reciprocal determinism, in which cognitive processes, behavior, and context all interact, each factor simultaneously influencing and being influenced by the others. Cognitive processes refer to all characteristics previously learned, including beliefs, expectations, and personality characteristics. Behavior refers to anything that we do that may be rewarded or punished. Finally, the context in which the behavior occurs refers to the environment or situation, which includes rewarding/punishing stimuli. Reciprocal determinism: Bandura proposed the idea of reciprocal determinism, in which our behavior, cognitive processes, and situational context all influence each other. This theory was significant because it moved away from the idea that environment alone affects an individual’s behavior. Instead, Bandura hypothesized that the relationship between behavior and environment was bi-directional, meaning that both factors can influence each other. In this theory, humans are actively involved in molding the environment that influences their own development and growth. Julian Rotter is a clinical psychologist who was influenced by Bandura’s social learning theory after rejecting a strict behaviorist approach. 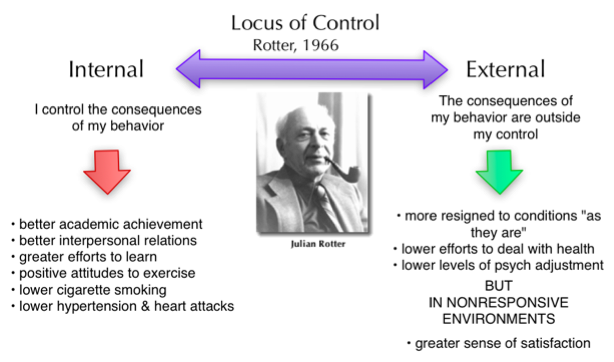 Rotter expanded upon Bandura’s ideas of reciprocal determinism, and he developed the term locus of control to describe how individuals view their relationship to the environment. Distinct from self-efficacy, which involves our belief in our own abilities, locus of control refers to our beliefs about the power we have over our lives, and is a cognitive factor that affects personality development. Locus of control can be classified along a spectrum from internal to external; where an individual falls along the spectrum determines the extent to which they believe they can affect the events around them. Locus of control: Rotter’s theory of locus of control places an individual on a spectrum between internal and external. A person with an internal locus of control believes that their rewards in life are guided by their own decisions and efforts. If they do not succeed, they believe it is due to their own lack of effort. An internal locus of control has been shown to develop along with self-regulatory abilities. People with an internal locus of control tend to internalize both failures and successes. Many factors have been associated with an internal locus of control. Males tend to be more internal than females when it comes to personal successes—a factor likely due to cultural norms that emphasize aggressive behavior in males and submissive behavior in females. As societal structures change, this difference may become minimized. As people get older, they tend to become more internal as well. This may be due to the fact that as children, individuals do not have much control over their lives. Additionally, people higher up in organizational structures tend to be more internal. Rotter theorized that this trait was most closely associated with motivation to succeed. A person with an external locus of control sees their life as being controlled by luck, chance, or other people—especially others with more power than them. If they do not succeed, they believe it is due to forces outside their control. People with an external locus of control tend to externalize both successes and failures. Individuals who grow up in circumstances where they do not see hard work pay off, as well as individuals who are socially disempowered (such as people in a low socioeconomic bracket), may develop an external locus of control. An external locus of control may relate to learned helplessness, a behavior in which an organism forced to endure painful or unpleasant stimuli becomes unable or unwilling to avoid subsequent encounters with those stimuli, even if they are able to escape. Evidence has supported the theory that locus of control is learned and can be modified. However, in a non-responsive environment, where an individual actually does not have much control, an external locus of control is associated with a greater sense of satisfaction. Examples of locus of control can be seen in students. A student with an internal locus of control may receive a poor grade on an exam and conclude that they did not study enough. They realize their efforts caused the grade and that they will have to try harder next time. A student with an external locus of control who does poorly on an exam might conclude that the test was poorly written and the teacher was incompetent, thereby blaming external factors out of their control. Critics of the social-cognitive theory of personality argue that it is not a unified theory and does not explain development over time. One of the main criticisms of social-cognitive theory is that it is not a unified theory—that the different aspects of the theory do not tie together to create a cohesive explanation of behavior. Another limitation is that not all social learning can be directly observed. Because of this, it can be difficult to quantify the effect that social cognition has on development. Social-cognitive theory tends to ignore maturation and developmental stages over a lifetime. It does not explain how motivation or personality changes over time. operant: A class of behavior that produces consequences by acting upon the environment. The social-cognitive theory of personality emphasizes both learning and cognition as sources of individual differences in personality. It posits that portions of an individual’s knowledge acquisition can be directly related to observing others within the context of social interactions, experiences, and outside media influences. This means that an individual can learn from observing others, as opposed to only being able to learn from their own experiences. This approach emphasizes both the environment and the individual’s own traits as important factors in personality development. Reciprocal determinism: Critics of social-cognitive theory argue that the theory does not provide a full explanation of how social cognition, behavior, environment, and personality are related (known as “reciprocal determinism”). One of the main criticisms of the social-cognitive theory is that it is not a unified theory. This means that the different aspects of the theory may not be connected. For example, researchers currently cannot find a connection between observational learning and self-efficacy within the social-cognitive perspective. The theory is so broad that not all of its component parts are fully understood and integrated into a single explanation of learning and personality. The findings associated with this theory are still, for the most part, preliminary. It does not provide a full explanation or description of how social cognition, behavior, environment, and personality are related, although there are several hypotheses. Another limitation is that not all social learning can be directly observed. Because of this, it can be difficult to quantify the effect that social cognition has on development. Similarly, many aspects of personality are subjective and can be equally hard to measure and quantify. Finally, this theory tends to ignore maturation throughout the lifespan. Because of this, the understanding of how a child learns through observation and how an adult learns through observation are not differentiated, and factors of development are not included.